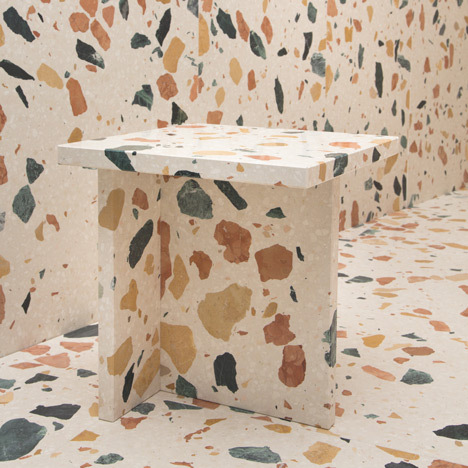 Milan 2014: British designer Max Lamb developed a multicoloured engineered marble for Dzek, which was used to build furniture that appears to merge with walls of the same material for an installation in Milan. Max Lamb was approached by London design brand Dzek to re-examine the production of man-made stone surfaces and came up with a material called Marmoreal that combines coloured marble with a polyester binder to create a durable stone for architectural applications. 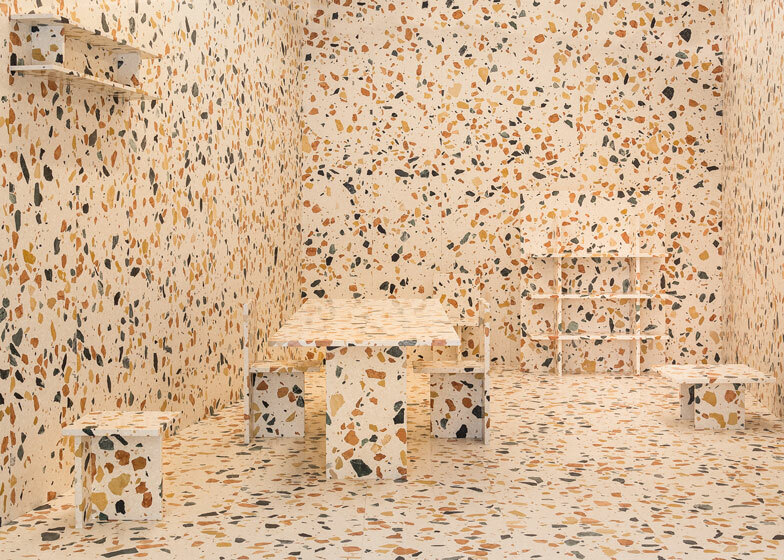 "We invited Max to examine agglomerate stones such as terrazzo and question how he would design and use one consistent with his practice known for its quixotic craftsmanship, disciplined logic, and a measured exuberance deeply rooted in materiality," said Dzek founder Brent Dzekciorius. Rather than the small chips of stone embedded in typical terrazzo, Lamb chose to celebrate the natural surface detail of marble by including large chunks in the mix for his manmade material. Marmoreal means "real marble" in Italian and is used to describe materials or objects that resemble marble. The four types of marble used in Lamb's stone come from the quarries around Verona in northern Italy, which are famous for processing marble. Green Verde Alpi, ochre-yellow Giallo Mori, and red Rosso Verona variants were selected to contrast with a background of white Bianco Verona marble. Combining these stones with a small amount of polyester resin results in a multicoloured material that is stronger and less porous than natural marble. "Composed of four historically significant Veronese marbles, Marmoreal is a material exploration that celebrates the individual qualities of these stones while acknowledging that the sum of its parts makes for something far more compelling," explained Dzekciorius. The material can be used to produce tiles or components for furniture, like the six pieces developed by Lamb to showcase the product's capabilities. These include a chair, bookcase, low coffee table, side table, shelf and a dining table or desk, all produced from simple geometric blocks of the engineered marble. At its installation during last week's Salone Internazionale del Mobile, Dzek presented the furniture in a space lined with tiles of Marmoreal that made it hard to distinguish the furniture from the walls. Dzek focuses on collaborating with architects, designers and artists to develop architectural materials that can be used as the basis for product collections. The Marmoreal project is the first to be completed by the company. Photography is by Delfino Sisto Legnani.